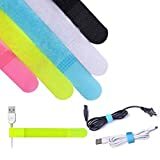 CONTROL YOUR CABLES: Whether for your laptop cords, chargers, headphones or other cables, out 20 pack of cable ties will keep your cables neat and organized and out of your way. WIDE USAGE: Suitable for a variety of cables, our cable ties come in 3 different cable strap sizes: 10''x0.8'', 6''x0.6'' and 5''x0.5''. REUSABLE AND DURABLE: Made from fabric material with attachments, our cable wraps are designed to last through many uses. MULTI-COLORED: Color coordinate your cables and cords easily with our cable ties; each cord wrap comes in black, white, blue, pink and yellow. SPECIAL DESIGN: Our cable ties are specially designed to fix your cables to the straps quickly and easily so you can spend less time worrying about cables and more time getting your work done.